The Codex Justiniani, called the 'Digest' or 'Pandects', goes back to 534 when the Emperor Justinian had imperial decisions and enactments compiled as part of his programme to codify Roman law. When law began to be studied in western European universities, starting with Bologna in the 11th century, the 'Pandects' became valued as basic legal texts. The need for huge textbooks like the Codex Justiniani fuelled the development of workshops to produce books outside of monasteries. In England, Oxford became a manuscript producing centre, turning out books like this one, which was owned by Merton College. During the middle ages, a specialised page layout was developed for glossed textbooks (textbooks with explanatory notes written between the lines and in the margins). 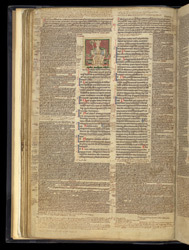 The 'Pandects' proper is written in larger writing in two columns in the centre of the page with ample margins left around it for the glosses, in tiny handwriting. Ideally the gloss is placed next to the relevant main text, but sometimes dotted lines were used to connect up 'interrupted' glosses. Some of the glosses were added later by masters or students who used the book. This section of the 'Pandects' deals with debt and usury--a contentious topic in medieval Europe. A portrait of a Roman emperor as an ermine-clad medieval king heads the section.